The first time I stepped into Caffebene at Seoul Korea, I fell in love with the aromatic coffee, the tranquil environment and vibes. Of course the café at Myeong-dong was the place to people-watch over a cuppa. 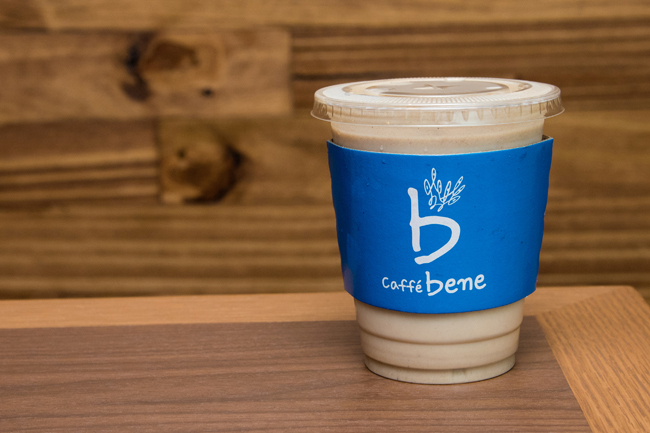 Since the opening of its first store in April 2008 in Korea, Caffebene has since grown to over 1,500 stores worldwide. 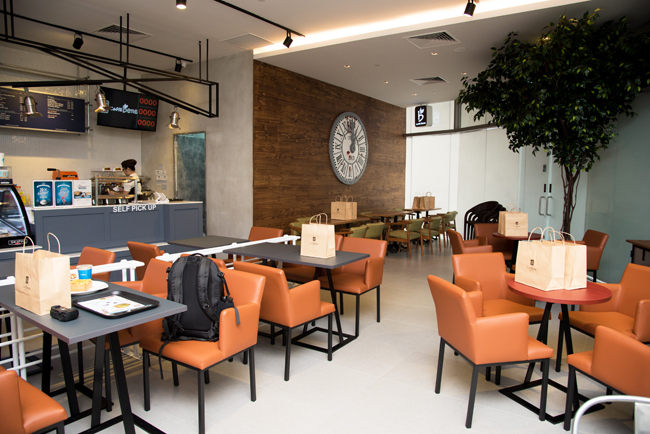 The local outlet at Level 2 of Vivocity occupies more than 1,400 square feet with more than 60 indoor and alfresco seats. A slightly different ordering system is adopted in Singapore. Instead of the usual buzzer used, the queue number reflected on the receipt will flash on the TV screen for self collection. Caffebene Singapore has a menu similar to that of Korea’s. However, there are tweaks to cater to the local palate. 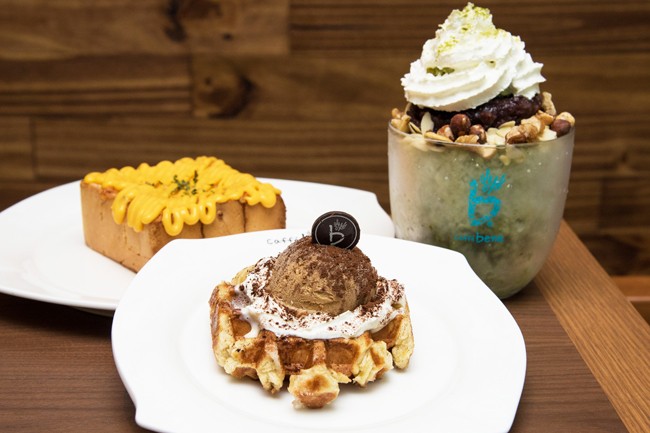 The selection of food offered is also smaller, with Shaved Ice Bingsu ($13.90 – $20.90) , Waffle ($6.90 – $10.90), Honey Bread ($12.90 – $13.90), Coffee, Tea and Yogurt Smoothie ($6.30 – $7.80). 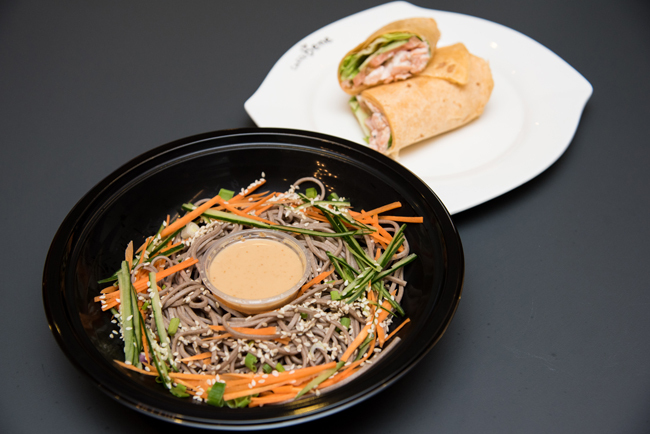 Exclusive to the Singapore outlet, a not-too-Korean-ish Gourmet selection of salads (such as Japanese Soba, Thousand Island Chicken) and wraps (Salmon Mayo, Chicken Avocado) are offered to cater to the office crowd nearby. The shaved ice Bingsu came in 2 sizes: Single ($13.90 – $15.90) and Double ($18.90 – $20.90), and 5 flavours: Coffee, Cookies & Cream, Green Tea, Strawberry and Pat Bingsu. 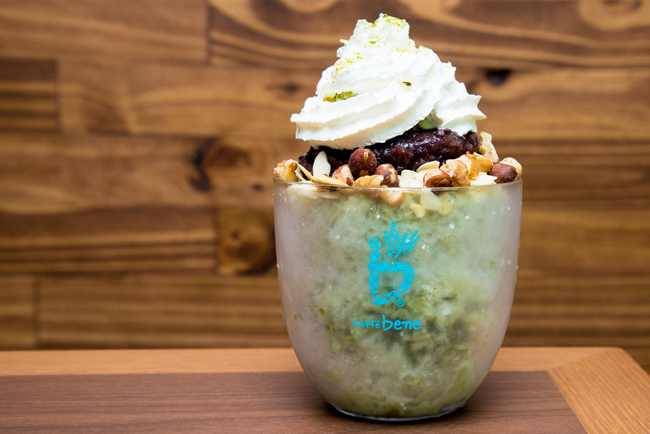 The Green Tea Tower Bingsu ($15.90 for single, $20.90 for double) was served in their signature bingsu bowl with red beans, almond flakes, macademia nuts and topped with a scoop of green tea gelato and whipped cream. 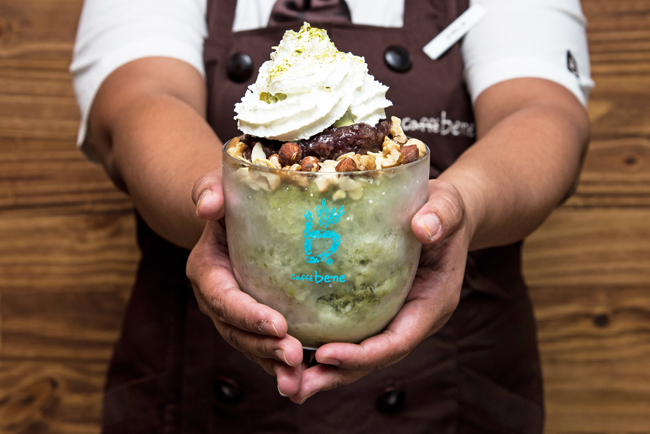 To eat the bingsu, press all the toppings downwards and start mixing all the ingredients with the shaved ice and end up with a bowl of half- melted shaved ice. The sweetness level was decreased, therefore the bingsu wasn’t as rich as the one we had in Korea. Nuts used were imported from various countries and somehow less crunchy. 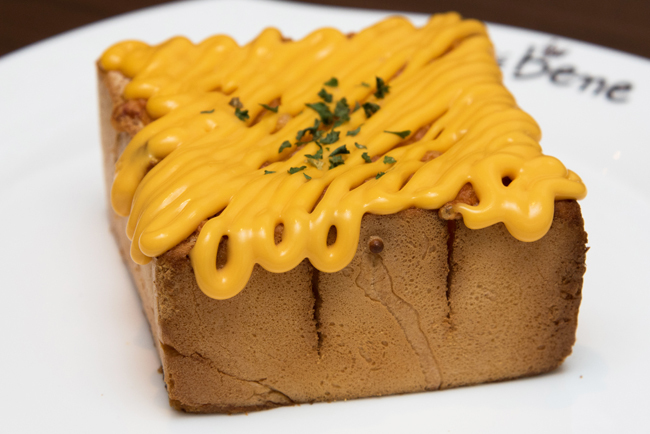 Apart from the sweet desserts offered here, the savory option of a Garlic and Cheese Honey Bread ($13.90) was most welcomed, with crispiness and crunchiness of the toast, matched with richness of the cheese in every bite. 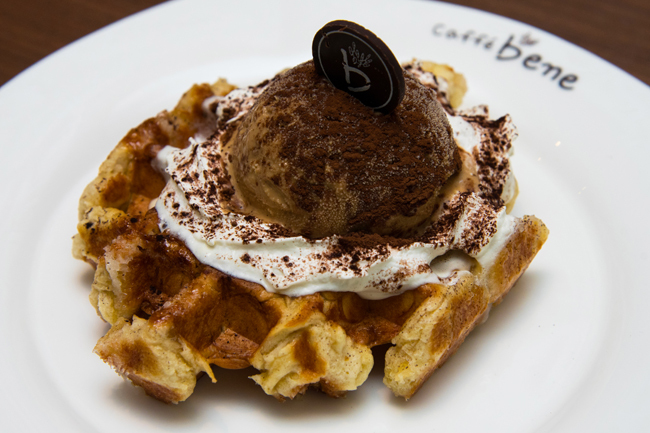 The Tiramisu Waffle ($10.90) came with a crispy on the outside and chewy on the inside texture, topped with a single scoop of espresso gelato and whipped cream and dusted with cocoa powder. Slightly more expensive considering its size, we would prefer a fluffy waffle to a chewy type texture. 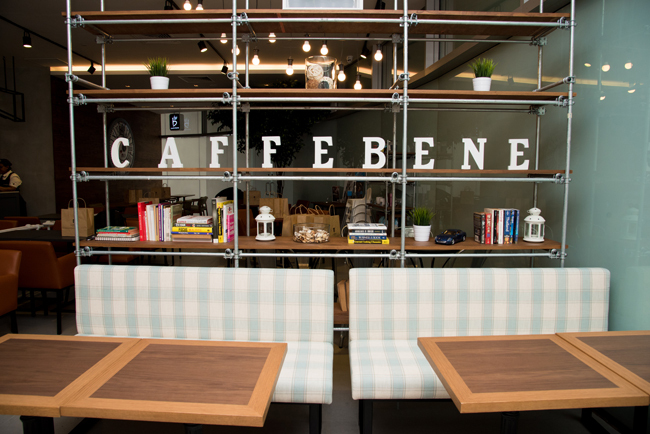 While the Bingsu was nothing to scream about (now that there are so many good ones in Singapore), the Caffebene in Singapore feels homely with the bookshelves, comfy chairs and welcoming environment. Can be the place to hang out, perhaps after the initial hype is over. * Written by Nicholas Tan @stormscape and Daniel Ang @DanielFoodDiary We were given an exclusive preview of the food offerings, and will return again to update this post. Its a new restaurant at Dempsey hill.. Very rustic, lots of info on the wall.Cuisine type, straight forward , creatively executed european dishes with premium ingredients but at the right price.